So far, Kansans have been blessed with a VERY mild winter. Heck, just a few weeks ago I was outside in shirtsleeves in 70 degree sunshine. Today . . .well, that's a different story. We got down into the single digits last night, and right now, it's 23F. Thank goodness the sun is shining and the wind isn't blowing much. I've been going out to the chickens to bring them unfrozen water and collect (hopefully) unfrozen eggs about every hour or two. The thermometer in the coop reads 35F, so I think we'll be OK. Besides, the chooks are all playing outside in the run. They're tough little birdies! One treat this morning was going into the hoophouse to pick them fresh greens. I didn't figure they wanted frozen salad on an already cold morning, so I hit my hoophouse stash of clover and grass (from the plots we haven't planted yet). I walked from the chill into the most lovely, warm, humid place and was surrounded by the smell of good earth and growing plants. Here, enjoy it with me. I can't wait to change that walkway down the middle into worm bins. The other upside is that I've discovered a new sport. I call it "Chicken Appling." The kids have been eating quite a few apples lately, and I'd been throwing the cores on the compost pile. Well geez, why? I dunno, but today I finally saw the light. I chucked the apple core out into the chicken run. Folks, you've never seen any professional sport that could beat this one. All the chooks chase the rolling core, and every now and then, one is lucky enough to grab it and run with it. Of course, all the others are immediately in hot pursuit. They tear around the yard, into the coop, back out of the coop, frenziedly clucking and cackling the whole time. I get to stand back and laugh! As a matter of fact, I'm eating an apple right now so I can go do it again. Pay Per View? Who needs it? I can create an appling game anytime! Our lovely "monster" in the basement (see previous blog: "Got Wood?") kept us toasty warm last night thanks to judicious applications of hedgewood. The sun streaming through our windows is heating the house nicely today. It never fails to amaze me how just plain old simple sunlight can improve my mood so much. Sure, it's cold, but the sun helps me feel warm on the inside, which helps quite a lot with the outside. I suppose I'm going to have to find a bigger rock too. Years ago on The Prairie Home Companion radio show, the News From Lake Wobegon (Minnesota) was about hunkering down and staying warm in winter. (I won't kid you--I'm too much of a wuss to live up there! It's COLD!) Well, one old man said that if you're still cold, you just carry around a bigger rock. Scott has this thing about gathering rocks, so I'll just go have a peek and see if I can find a nice big one. That should help, as long as I don't drop it on my foot. 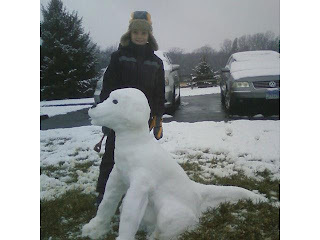 The possibility of snow in the near future has the kids more than a little excited. They have so many things they want to build out of snow that we'll probably need 3 feet worth to do them all. 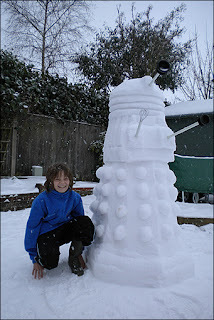 They want to build snow men, they want to build snow Daleks. The latest is a snow dog. Stay warm, folks. I'm going to bundle up and go Chicken Appling!